In my last two posts I talked about the importance of mindful eating as well as the importance of being compassionate with ourselves as eating healthy becomes a practice instead of a quest for perfection. Eating mindfully, helps us to slow down which in turn makes us more conscious of what and how much we are eating. Slowing ourselves down is a process; making mealtime an opportunity to form meaningful connections with our loved ones as well as ourselves requires effort and intention. As you begin try and plan ahead when doing groceries. If you go into the grocery store without any idea of what recipes you plan on making then you will likely find yourself buying the same meals that you may be trying to avoid. Choose recipes that are both nourishing and tasty. Without a doubt, it requires a slight learning curve to initially try a new recipe or to find those new ingredients that you have never heard of. However, after you have made it once you will likely find it a lot easier to incorporate a new recipe into your diet. Even if you try just one new recipe a week, in no time you will have a whole array of healthy, tasty recipes that will be part of your diet. 1) Eat at a Table – Make a point to eat only at a table. Years ago I read the book “French Women Don’t Get Fat” by Mireille Guiliano. The author points out that in France people do not eat in their cars and on their couches. They sit at nicely set tables to eat. In fact, unlike North Americans the French do not even have cup holders built into their cars, at theatres and every other possible location because eating and drinking is reserved for sitting at a dinner table. It is almost guaranteed that if you are eating anywhere but your table, then you are definitely not eating mindfully. How can you eat mindfully when you’re sitting at your desk working and eating or standing at the counter playing on your iPad? Sitting at a table to eat with no distractions is the first step towards making eating a mindful experience instead of a chore. 2) Jazz up the Dinner Table – Mindful eating will seem less like a chore if the dinner table isn’t stacked with papers and magazines. Take the time to set the tone by tidying the kitchen before you eat: clear the kitchen table, set out the nice dinner plates and light some candles. You may find this is an extremely effective way to unwind from the day. The quiet peacefulness of your new found dinner table may end up being one of your new favourite times of the time. 3) Feed Your Ears – Be aware of what you want to listen to when you are eating. One technique that has proven to be extremely effective in reminding our brains to calm down and to improve digestion is listening to slow-paced, relaxing music during dinner. Listening to relaxing music at dinner can make all the difference in making dinner time a meaningful retreat from the day. On the flip side, if you work in a noisy environment, sometimes listening to nothing at all is preferable. Need I even say that TV does not count as food for your ears? Once you have made the preparations for mindful eating take a moment to engage with your body and how you are feeling before actually eating. 1)Just Breathe – Taking a moment to take a few deep, slow breaths before you eat will flood your system with oxygen and turn down the stress hormones. This simple strategy is very effective for portion control because the act of pausing and breathing brings you back to centre and reminds you to be mindful. Try taking six deep belly breaths and allow yourself to feel your body progressively relaxing with each breath. 2) Eat Your Feelings – Eat the way you want to feel. My mother always said ‘Garbage in, garbage out’. It took me years to understand what that really meant. So ask yourself how this food is going to make you feel and if you want to feel that way. If not, then consider if there is a better option. Try to shift your perception of eating healthy to one that sees yourself as nourishing your body when you eat healthy instead of depriving yourself of junk food. 3) Check-In– This is a key element in mindful eating. Before you put one bite into your mouth ask yourself why you are eating and how hungry are you? Rate it on a scale from 1 to 7 ( with 7 being hungriest). As you continue eating, continue to rate your hunger—stopping when it has reached a 1 or 2. Ask yourself how you are feeling emotionally and physically. 4) Gratitude – Taking a moment to focus on all the blessing in your life regardless of your spiritual beliefs is an excellent way to dissolve stress. No matter what you are going through gratitude has been found to be one of the most powerful ways to alleviate stress and depression, even among those who are facing the most difficult of times. This helps to create calm and prevent emotional over-eating. 5) Engage in the Elements – As an addition to gratitude, you can also become a more mindful eater by considering before or while you are eating, the connection between your food and nature. You can even turn this into a before or during dinner game. • Ask yourself and your children if sunlight, rain, and soil were involved in the growing and harvesting of your food. • Consider who might have planted, cared for and harvested your food and how long this took. Where did your food come from? • How will you save leftover food or and dispose of containers and scraps? Compost? Garbage? Recycling? Ensuring we have a small ecological footprint is another aspect of mindful eating. In my post Mindful Eating: Your Relationship with Food, Your Waistline and Your Health that we are eating spiritually when we are eating mindfully. Eating spiritually or mindfully does not begin and end at the dinner table. We do this when we purchase food that supports a sustainable and eco-friendly world, when we support companies that provide safe, fair wages to their employees or when we opt to pay a little more to support organic or local family farms. In a time when people are so busy driving their children to hockey practice and dance lessons, completing homework and working shift work it is little wonder that many families do not sit down to eat dinner together. However, whenever possible, make the point to sit down together and to eat as a family. Tell your children to put the electronic devices away and turn the TV off. Make dinner time an opportunity for everyone to connect after a day of hurried schedules. There are too many games, traditions and rituals to mention that can be practiced at the dinner table and while at first they may seem silly they can be powerful in reminding us of our connection with food. The sooner you start this with your family the more they will eventually ‘buy into’ it. Younger children are particularly responsive to this. 1) Gratitude/Prayer – As I mentioned earlier taking a few moments before you eat to breathe and offer thanks can greatly shift your attitude. If you are not religious then try demonstrating some simple gratitude for all the individuals and elements that were involved in the creation of your meal. 2) High/Low – This is a relatively simple exercise and offers a great opportunity for meaningful and connected discussion at the table. Essentially, each family member takes the time to share their ‘high’ and ‘low’ of the day. This is a great way to keep the lines of communication open with your children. Example: My high of the day was going for a walk with my mother. My low was waking up late. 3) Mindful Eater – I recently heard on the radio that the French have a long history of being mindful eaters—hence why their waistline is much smaller than the rest of Western civilization. A regular practice at French dinner tables is for parents to encourage their children to describe the different textures, tastes, and smells of their food. Taking time to describe your culinary experience is a great way for everyone at the table to be more conscious of their eating as well as how much they are eating. 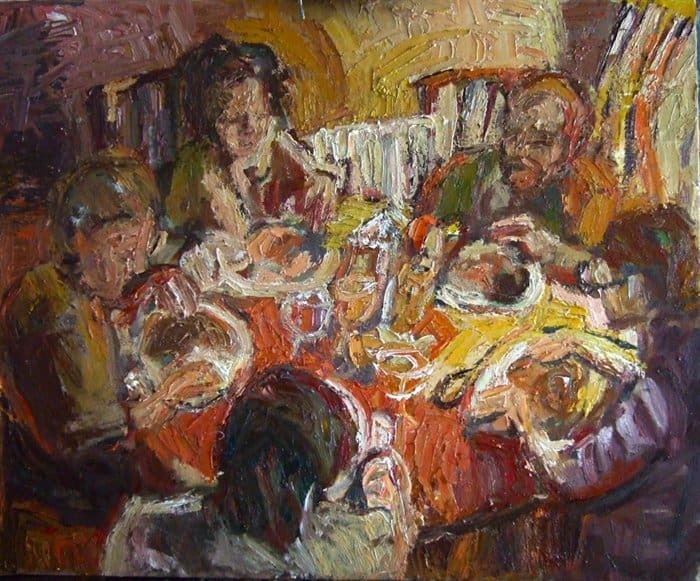 4) Politics, Religion and Keeping the Peace – Ever wonder about the wisdom behind not talking about religion and politics at the dinner table? It is because when we are tense, argumentative and or ‘fired up’ our digestion is poor. Even a slightly heated discussion causes the sympathetic nervous system to go into flight or fight mode thus slowing digestion. So save family meetings or heated topics for later on. Keep the topics at the dinner table peaceful. 5) The Final Act – Clearing the Table – I really believe a part of mindful eating is sharing not only the conversation and the food but the clean-up as well. Eating mindfully is about showing gratitude to the person or people who prepared the food by firstly taking only what we are going to eat so that we are not wasting, as well as saving any leftovers. When we take the time to make food preparation, eating, connecting and cleaning as sacred we cannot help but make better choices for ourselves. By now you should have several strategies and ideas on how to make meal time more mindful, meaningful and pleasant. The shift is to see eating as an experience to reconnect with yourself and your body. If you have not been doing any of the practices that I have mentioned already then you may even feel overwhelmed with all the changes you feel you need to make. I really believe slow and steady wins the race. Unless you feel particularly motivated to try several of the ideas at once I have recommended, I would suggest adopting one or two each week. Make those a habit and then gradually incorporate more mindful eating habits into your lifestyle until eventually mindful eating becomes second nature.